"I am tired of being used, hurt, and cast aside. In a time long forgotten, in a land beyond history, an illness has hit a nation and left a mark in it’s wake. The Blood Fever has caused carnage of both the rotten and supernatural variety. The Young Elites by Marie Lu plays off of the fear of anything different from ourselves, with those who embrace these differences and those who despise them. In other words, it’s modeled after our very own societies. The one’s who are left marked by the fever are Malfettos, of which within this sector are those left with elemental and fantastical powers. These are the Elite. Adelina is among them. After the Blood Fever leaves her motherless and marked with unnatural silver hair and a scar where her left eye used to be, she grows up physically and emotionally abused by her father, and second best next to her younger sister Violetta. She soon finds that she may not just be another Malfetto, and is introduced to the Dagger Society, of whom she must gain their trust and their strength. What she does not know is that she may be the most powerful one of them all. Can Adelina put her past behind her, and gain confidence? Can she become a Dagger without putting her sister in danger? With fear and pain as her fuel, can Adelina ever find happiness... or does it lead a path of destruction? The author plucks you from your chair and guides you through the lands of Kenettra. She does a marvelous job of setting the scene! I remember back when my English professors would say to “Show, not tell!” and this books is a great example of this concept. The scenarios and characters are set before us to explore and I felt like I was actually there, walking beside Adelina and feeling her emotions. To me, especially in a fantasy, this is a necessity. Combined with the great descriptions we are given a tragic hero protagonist, an adventurous action-filled plot, and multiple point of views to better understand and go into more depth with the different characters’ storyline. The characters are given a voice and it personifies them just that much more. Don’t believe me? Read all the way through the Epilogue, and I guarantee you will feel the character shift. From the development of Adelina to the plot twists, The Young Elites is full of surprises! It became increasingly harder to put the book down, as I entered the realm of the “just one more chapter” mantra. You will root for Adelina, then question her choices; you’ll smile in triumph and gasp in horror. You’ll be left enraptured! I, for one, am extremely excited for whatever is to come next. This book has been the best book I’ve read all year, without a doubt! 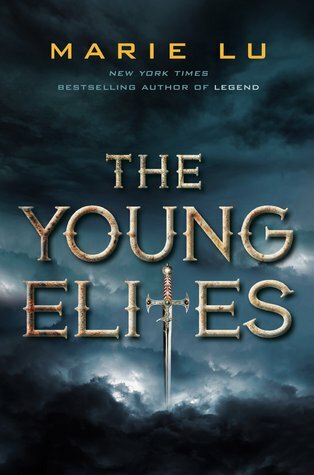 If you’ve enjoyed fantasies like The Grisha Trilogy and The Throne of Glass series, you’ll want to put The Young Elites at the top of your TBR list!